My tenth ground of 2016 was on Saturday 6th August at Alfredian Park in Wantage, Oxfordshire. The match was Wantage Town vs. Paulton Rovers in the Southern League Division One South & West. The ground is on the southern road into Wantage a short walk from the town centre. It runs against housing for some of its east side but is otherwise entirely surrounded by fields in this rural part of the country. The nearest railway station of Didcot Parkway is some 9 miles east of the venue. Alfredian Park has just a single covered stand which runs for around half the length of the east side of the ground. This stand is a mixture of seating and standing areas - the southern most part of it consists of 85 seats with a raised concrete platform next to this. Beyond this there is another section of seating in the form of two rows of wooden benches and finally the northern end another raised concrete platform area. The rest of the ground is uncovered standing - the south and western sides have a strip of gravel and behind this a decent sized grass area to view from. The car park is directly behind the northern goal and behind this is the club building which houses the club house and player areas. This was the opening day of the Southern League season and the game took a while to get going. Paulton edged proceedings by creating the more clear cut chances. The breakthrough came just before the break when good Reeko Best did well to steal the ball on the right-wing before drilling the ball across the face of goal to allow Kailan Gould to bundle in. Paulton's goal just before the break was then matched by one just after as they went two goals to the good. This one saw the ball clipped into the box and a big deflection off Wantage defender Stuart Cattell saw the ball loop over the keeper and into the net. In the 53rd minute the visitors put the result beyond doubt with an excellent team goal. Will Hailstone did well down the wing and laid the ball off for Elliott Gibbons to curl into the corner. Almost straight from the kick-off Paulton then very nearly added a fourth. It came about when the Wantage goalie and a Paulton attacker both went for the ball on the edge of the box sending it cannoning back off the crossbar and away. 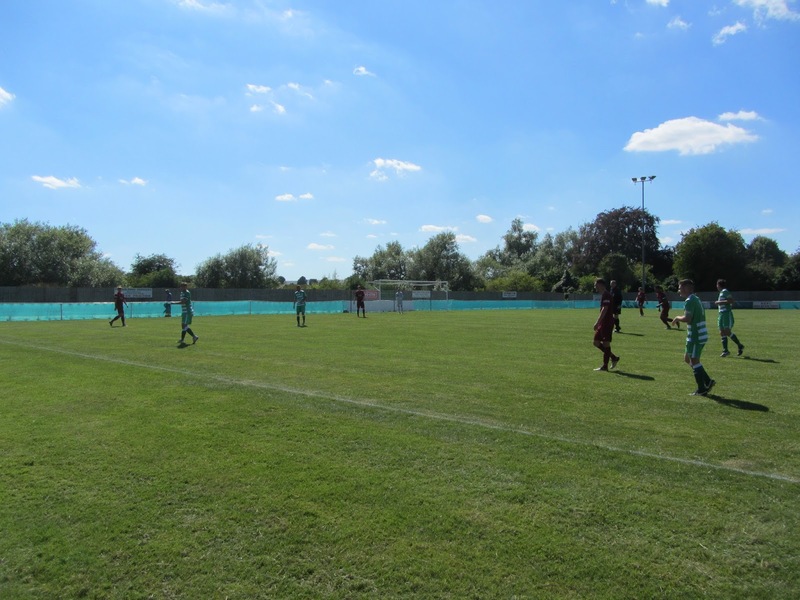 This was the wake-up call for Wantage to get back into the game and avoid a thrashing and they did do that with a much more positive last half-hour. The visitors came close to rounding the tie off with another goal in injury time but blasted a shot straight at the keeper from a few yards out.